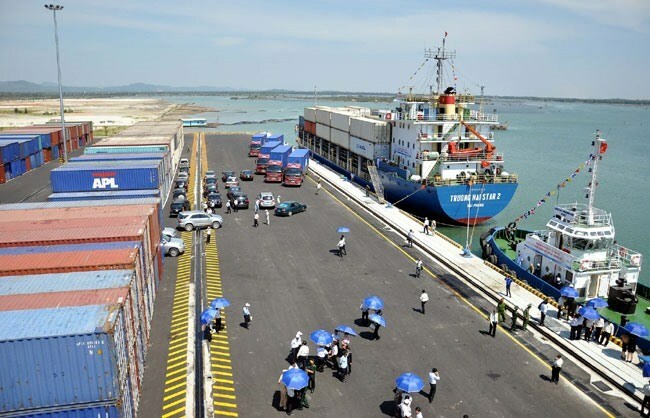 Quang Nam (VNA) - Quang Nam province has put into operation Chu Lai Port as a key logistics hub for the central and Central Highlands region after a one-year upgrade and expansion. The project carried out by Truong Hai Auto Corporation (THACO) included the expansion of the berth upstream, the expansion and upgrading of the warehouse system and the completion of infrastructure, said Tran Huu Hoang, Director of THACO Logistics Co., Ltd and Director of Chu Lai Port. The project cost 120 billion VND (5.2 million USD), raising the level of investment to build the Chu Lai Port from 2010 to the present to nearly 800 billion VND, he said. “The port hosted 150 cargo ships with a total 600,000 tonnes of cargo including 23,000 TEUs (twenty-foot equivalent units) in the first six months this year,” said Hoang. Extended by 171 metres upstream, the Chu Lai berth measures nearly 500 metres, with a depth alongside berth of -9.5 metres capable of receiving three vessels of 20,000 tonnes at the same time. These include general cargo ships and liquid cargo ships. Before the upgrade the berth could only receive two 20,000-tonne vessels. The warehouse and workshop system has been expanded from 71,040 square metres (2016) to 91,200, including bonded warehouses (57,600 square metres), warehouses (13,440 square metres), unpackaged cargo inspection workshops (20,160 square metres), among which the unpackaged cargo inspection workshop is an entirely new facility put into operation in early 2017. The Chu Lai Port is divided into three separate functional areas for different types of cargo, including containers, bulk and liquid cargo to meet the needs of ships arriving to load, unload and deliver freight. The Chu Lai Port also invested in loading and unloading equipment, such as Liebherr cranes, tire cranes, container reach stackers, Folk Lift with modern and complete loading and unloading equipment, with tugboats and more than 20 high-capacity tractors to ensure optimum port performance. Besides serving the transportation of finished products, materials, spare parts for automotive production and assembly and supporting industries of THACO in Chu Lai, the port also provides a variety of useful services for external businesses and customers, including ship towing and rescue services; cargo loading, unloading, tallying, and warehousing; domestic inland shipping, freight forwarding and shipping agents; bridge and berth services, and related shipping services. Hoang said that among the total volume of cargo through the port, 15 percent belong to more than 50 external enterprises, consisting mainly of food, agricultural products, plastic pieces, tires, paints, chemicals, batteries and consumer goods. In addition to domestic shipping routes, the port has launched direct sea routes to Incheon Port in the Republic of Korea (RoK), and Fangcheng Port in China, and planned to open new routes to other ports in China, the RoK and Japan. It also plans to provide further logistics service for foreign direct investment (FDI) businesses in the Chu Lai Open Economic Zone. According to Hoang, in order to build the Chu Lai Port into a logistics hub of the key economic region, the Chu Lai Port has proposed that Quang Nam province support the dredging of the channel to a depth of -10.7 metres to accommodate 30,000-tonne vessels by 2019, and further to a depth of -12 metres to accommodate 40,000-tonne vessels after 2020.